Save on your next purchase of remanufactured Epson WorkForce 545 ink cartridges at 1ink.com. We offer incredible deals on our remanufactured replacement Epson T126 ink cartridge series, which includes T126120 Black, T126220 Cyan, T126320 Magenta, and T126420 Yellow. Replace your old ink or stock up with high-performance remanufactured ink that reaches the industry standard of quality. Every document you print is important—from high-resolution photos to legal documents and business reports. Make sure everything you print is produced perfectly with our Epson WorkForce 545 ink cartridges. 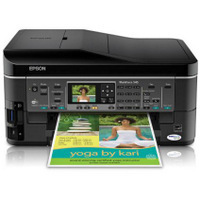 Whether you’re shopping for replacement ink cartridges to use at home or to restock the office printing supply, 1ink.com has the best deals on Epson ink. All of our ink for Epson WorkForce 545 goes through demanding quality-control tests to assure that they meet the original equipment manufacturer (OEM) standards. At 1ink.com, we believe that you’re not getting a great value on affordable products unless they perform at the highest levels. If you need help locating the perfect cartridge for your Epson printer, call our friendly customer service team. They’ll help you navigate the website and fill you in on how you can take advantage of free shipping and handling on orders over $65. Save money by purchasing remanufactured Epson inks and take advantage of our full 1-year warranty on all Epson cartridges.